Lock in a great price for An Lam Retreats Ninh Van Bay – rated 9.1 by recent guests! I liked the villa, so large, spacious and the bed so comfortable. I was recommended for trekking to waterfalls and that was amazing! I loved the friendly staff. They were so helpful. They were there anytine you need. What else, oops, the food here is so fabulous, especially Vietnamese dishes. I love Pho for breakfast. 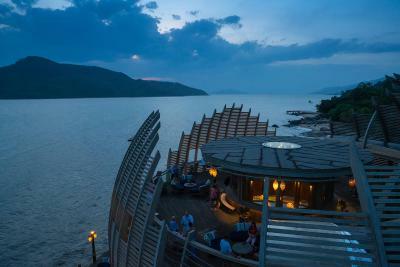 The restaurant is so stunning in its design with great view to the bay. Fantastic holidays here! Beautiful villas, isolated location, free coffee and snacks in the afternoon. Interesting architecture. Friendly vietnamese staff. The location was amazing but you are stuck on the island and can’t get off u less you pay USD 100. The staff once on the island were amazing very helpful and friendly. The rooms are spacious and luxurious. Great beach and activities and lovely pool. Stunning retreat resort with amazing staff, facilities and private villas. We were looking forward to staying here and it managed to exceed our expectations. The staff couldn't do enough for you and were attentive without being overbearing. The bay (sea) view villa was fantastic, comfortable and well designed. Great transfers to and from the resort. Although the resort is a retreat style the activities program was great and there was plenty to keep us occupied during our 5 night stay. A stunningly beautiful place, the staff were incredible and so welcoming. Thoroughly recommend that you barbecue at the spring, you won't regret it one bit. Location and tree top room so beautiful,food was excellent, staff very helpful.... Airport pick up service excellent but not the drop off unfortunately. Full privacy and wonderful rooms. The architecture of the retreat is unique and amazing. The staff are very welcoming and would go out of their way to help you. The atmosphere is very nice and brings a calm and relaxing vibe. The villa with private pool was amazing. The housekeeping was very discreet & done whilst we had breakfast in the restaurant. The bed was huge and comfortable and faced looking out to see. Drinking water was provided free of charge in the room and with meals. The food was delicious and fresh with plenty of options on the menu. The restaurant itself is an architectural work of art. We didn’t take up any of the excursions on offer as we loved the villa so much! The rooms were incredible! Loved the beds, outdoor bath. Had wonderful attention from the Executive Chef & Property Manager. Breads & pastries fantastic! An Lam Retreats Ninh Van Bay This rating is a reflection of how the property compares to the industry standard when it comes to price, facilities and services available. It's based on a self-evaluation by the property. Use this rating to help choose your stay! Boasting its own tranquil private beach, An Lam Retreats Ninh Van Bay, a gay-friendly resort, offers a range of free services, such as 90-minute yoga/meditation session, waterfalls trekking in the resort's back mountains, roundtrip boat transfer, as well as afternoon tea with snacks and coffees. Guests can take a dip in the year-round outdoor pool, or relax in the sun terrace while enjoying the panoramic sea views. Featuring air conditioning, all spacious units are fitted with a seating area with sofa, wardrobe and private entrance. All units attach a private balcony and terrace with outdoor furniture, where you can relax out with a cup of coffee or appreciate the views. Views of the garden, sea or mountains can be seen from certain units. A flat-screen TV with satellite channels and DVD player are provided for your entertainment. A coffee machine, mini-bar and electric kettle are available. Private bathroom comes equipped with a bath or shower, free toiletries and hairdryer. For your comfort, you will find bathrobes and slippers. Speaking 3 languages, staff at the 24-hour front desk are willing to assist with currency exchange, luggage storage and other concierge services. Shuttle services and airport transfers can be arranged upon request at an additional charge. A spa and wellness center, where guests can relax with professional massage, is featured. You can engage in various activities, such as snorkeling, kayaking, rowing round basket boat and playing volleyballs free of charge. The nearest airport is Cam Ranh International Airport, 27 mi from the property. The on-site restaurant, Sen, serves delectable spread of Vietnamese specialties, Asian delights and international dishes. Guests can grab a drink at the in-house bar. This property is also rated for the best value in Ninh Van Bay! Guests are getting more for their money when compared to other properties in this city. When would you like to stay at An Lam Retreats Ninh Van Bay? Featuring a desk, this room is fitted with a seating area, flat-screen TV with cable channels and coffee machine. Views of the mountains can be seen from the terrace and balcony. Private bathroom has a bath, hairdryer and free toiletries. Boasting views of the sea and mountains, this room features a private pool, is attached with a balcony and has a dressing room with wardrobe. A seating area with sofa and satellite flat-screen TV and coffee machine are provided. Private bathroom is fitted with a bath, slippers and hairdryer. Featuring an outdoor swimming pool and sun loungers, this villa is furnished with a separate indoor and outdoor seating area, where guests can leisurely enjoy cups of coffee or tea. Views of the mountains and sea can be seen from the terrace. An private bathroom is fitted with bathtub, orbit lounger and free toiletries. Bathroom and slippers are available for your comfort. This treetop villa has a private balcony and terrace opens up to views of the sea and mountains. Featuring an outdoor swimming pool and sun loungers, this villa is furnished with a separate indoor and outdoor seating area, where guests can leisurely enjoy cups of coffee or tea. An private bathroom is fitted with bathtub, hairdryer and free toiletries. Bathroom and slippers are available for your comfort. This villa has a balcony, sofa and private entrance. House Rules An Lam Retreats Ninh Van Bay takes special requests – add in the next step! An Lam Retreats Ninh Van Bay accepts these cards and reserves the right to temporarily hold an amount prior to arrival. Please note that the resort is accessible by boat only. Guests are kindly requested to inform the property your flight details and expected arrival time for proper transfer arrangement. You can use the Special Requests box when booking, or contact the property directly with the contact details provided in your confirmation. Everything was really beautifull, staff is just perfect. We went on trekking tour to se the nature up the hill and were amaised. Welness service is for recomandation. I felt at any opportunity they were trying to make Extra money. They provide a free boat transfer to and from the island when you arrive and depart just tried to charge USD 50 on arrival stating it was a change of policy. The front desk needs a little more work on customer service. Prices (food, drinks etc.) were more expensive than other resorts, but this was expected given the style of resort & quality of the offering. Overall this is a beautiful property. But there some things off such as the communication between management and staff. It seems like the staff wasn't able to respond to questions without first seeking the approval of upper management. Some other issues involved an uncomfortable "king" bed that was really converted twins with a flimsy topper. Also, the pool chairs were removed around 4, and the pool was no longer staffed so we needed to go and find out own towels and chaise lounge cushions. Finally, billed as an adult only retreat, this was not the case as there was a child splashing around in the pool. For the price you pay, there are surely improvements that can be made to elevate the guest experience. I was poisonned because of the water placed in the expresso machine in our room. I was in a very serious condition, however I had to really insist for the staff getting me a doctor. Spend two days suffering in the room. The only gesture the hotel did was offering a bowl of rice. When we’ve finally left, they even failed to call a cab in time for our train and didn’t propose to give us a ride with the hotel’s car. That was our experience at Ninh Van Bay. My only qualm would be the cost once you are there. You pay for the amazing location and facilities but the food and drink once you are could have been more affordable considering you have nowhere else to go. The Spa needs a massive improvement, also you can only get internet 30 minutes a day,the resort return drop off service was very poor, i was so tirsty for one hour because they provide us very warm water, infact the pick up service was excellent!!!! There isn't a lot of activities to do while you stay at the retreat. Construction works started very early in the morning and was noisy. Tours around the city are pretty expensive and it's difficult to go see the city. Food is decent but not great. The cocktails weren’t great in the happy hour. Would have liked more activities, such as paddle boarding & sailing. The stunning location was supported by the amazing food and superb staff.